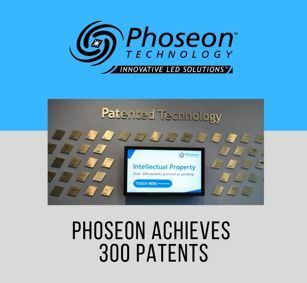 UV curing technology developer Phoseon Technology announced that it has been granted a new patent in the US and achieved a milestone of 300 patents awarded. Phoseon’s patents are organized in 54 patent families, covering critical design, process, and other photonic technologies across all the major markets worldwide. Phoseon’s new patent granted UV LED fiber curing system ensures high speed curing of optical fiber to deliver uniform and concentrated light for a fast cure, increased output and simplified process control. The Fiber Curing System consists of a high intensity UV LED light source specifically matched to Phoseon’s patented Fiber Reflector Unit (FRU) to direct the UV energy uniformly around the circumference of the fiber. LED technology greatly increases cure-speed, reduces energy consumption and increases factory utilization with high lamp reliability. Insight LiDAR Debuts Long-range LiDAR Based on FMCW for Autonomous Vehicles Lighting Science Launches Its Biological Lighting Spinoff Healthe Inc.